Emme is officially a big girl now that she is 2 1/2 years old and with that responsibility comes a big girl room, of course! That's the fun (but bittersweet) part for me. All of us moms say it all the time but time truly flies by. I was excited for her big girl room for more than one reason but also felt a little overwhelmed because her bedroom is pretty small so I knew I had to work with the right pieces in order for it to be comfortable but still a functional bedroom. As you all know, I love to decorate my house. I can decorate rooms all day. It's truly one of my passions. 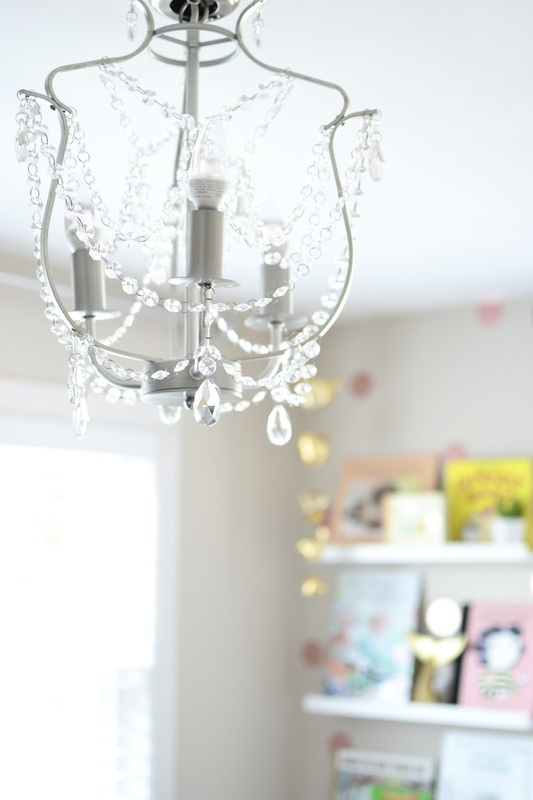 For today's home decor post I am happy to share Emme's big girl room reveal in collaboration with Raymour & Flanigan. I hope you love it as much as I loved decorating it. As far as decor, I always love the light and fresh-airy colors and textures no matter what the gender. I think I've said that a lot in my home decor posts. I just love the feel and coziness of neutrals and how you can easily update it with little touches. 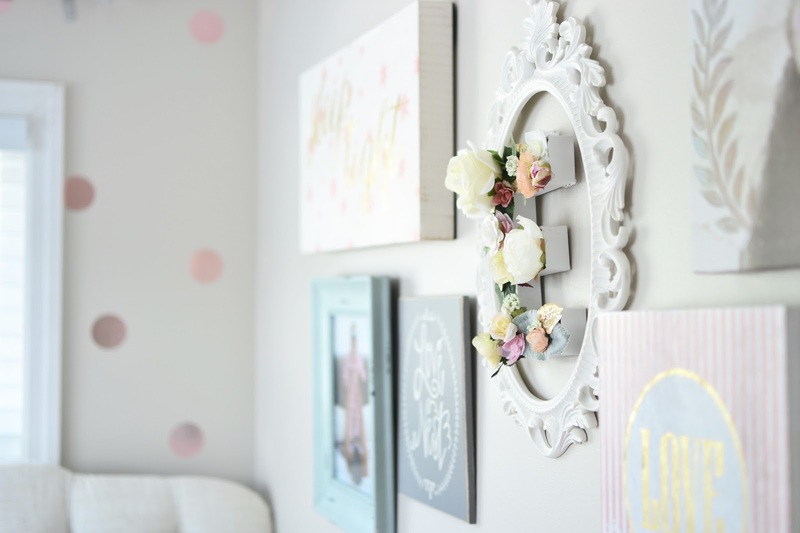 For Emme's room I chose the whites, golds and blush pinks and while this gives the room a very delicate and soft feel, I still wanted it to be feel like a little girl's bedroom. 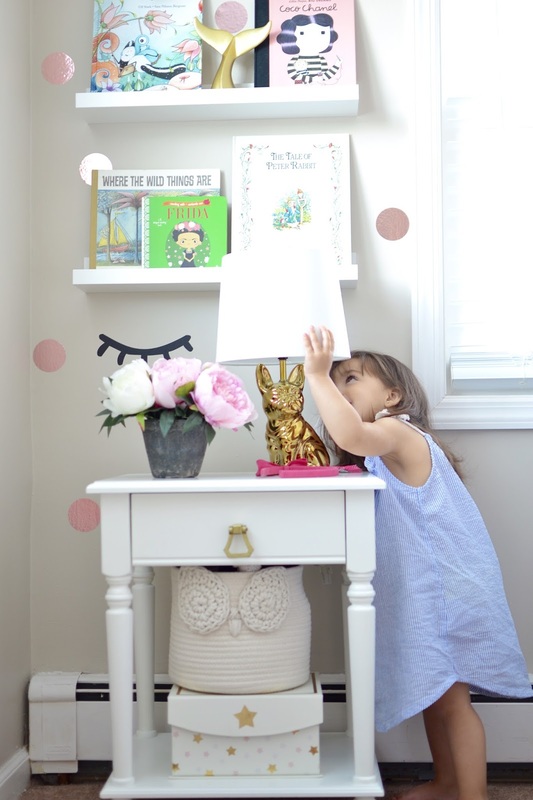 Here are some tips when updating your kids' bedrooms: It's important to start by pinning your ideas onto a Pinterest board (or something similar) and work your way from there. I prefer Pinterest, you can find my Pinterest page HERE. You don't have to purchase exactly what you see on the photos, use it more as a mood board to find your home decor style and have a clear idea of what look you're going for. 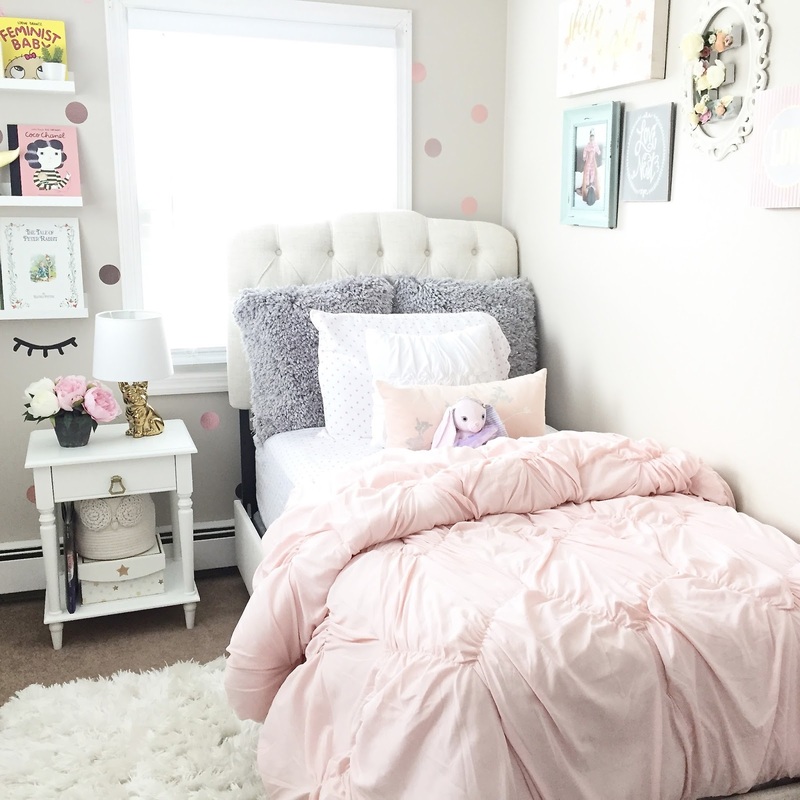 Since in this case, I was redecorating Emme's nursery into a big girl bedroom, we needed a new bed; we chose a twin size bed due to her room size otherwise I recommend getting a full size bed, if you have the space. We didn't get everything new and if you're on a budget, repurposing pieces like dressers or night tables is a great way to save money. I always change the knobs from every dresser I buy, I like to add my own touches throughout the room and this is a great inexpensive way to do so. The new items in her bedroom are the mattress, box spring, bed and night table. I kept her little dresser because it's perfect for her room and the drawers are nice and roomy. I simply changed the knobs for an updated look. So remember to be functional to your needs especially when it comes to room size and purpose. When it came time to choosing a bed for Emme, I went back and forth between a white wooden bed or an upholstered bed. I've always loved upholstered beds so we went for it. Raymour & Flanigan has a great selection of styles and prices. We picked the Argona Bed in Linen Talc, it looked so nice on the website but when it was delivered I was truly in love. The quality is great and the color is even better in person. In my opinion the bed is what makes the room and I think the bed was definitely the inspiration behind Emme's entire bedroom. It's pretty, soft, delicate yet has some personality. I love the detail of the tufted headboard and I love that it's a bed that she can have until she's older. If you are looking for a cute upholstered bed for your bedroom or your kids room, this is the one! It comes in every size. I want one for my bedroom! As far as mattresses went, we are a plush soft kind of family. I love comfy soft mattresses and wanted the same for Emme. After going to my local Raymour & Flanigan showroom and testing out the mattresses I fell in love with the King Koil Perfect Response Elite Lakeside Pillowtop Twin Mattress, it's super soft and perfect, it's one of those mattresses that will last a lifetime. We originally chose the 9" high profile base (or spring box) but we ended up exchanging it for the low profile 5" base instead, because I felt the 9" was too tall for Emme. Thankfully R&F was great at helping me make the exchange a smooth process. Their customer service made my life easier. 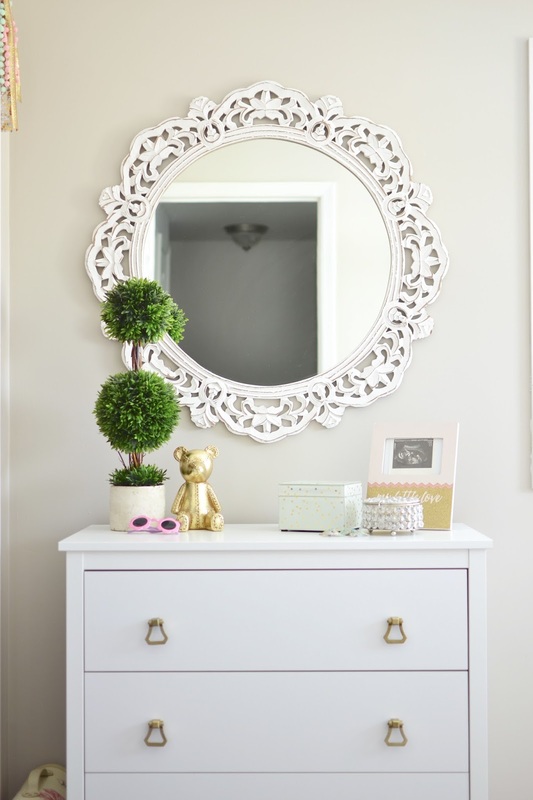 My number one tip when redecorating or updating your kids bedroom is to purchase pieces that you will use for years to come, so that it's a one time investment. 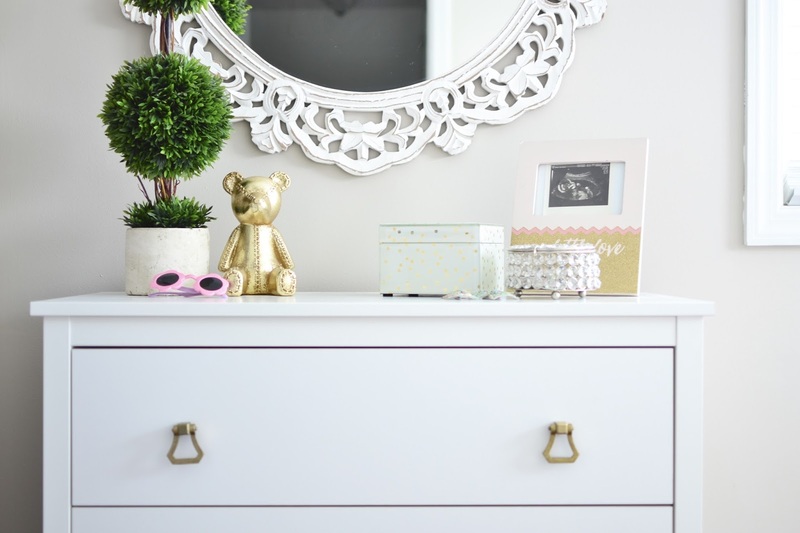 Choose furniture that will grow with them and that you can redecorate easily and always remember that quality is key, which is why I chose to work with R&F, their furniture is sturdy and heavy duty, I know that kids will have these forever. By choosing neutral colors for your rooms, you can always update them as they grow. Simply add or change the accessories, like throw pillows or linens and you have a new room! It's always fun to update rooms that fit their future personalities and age as they get older. 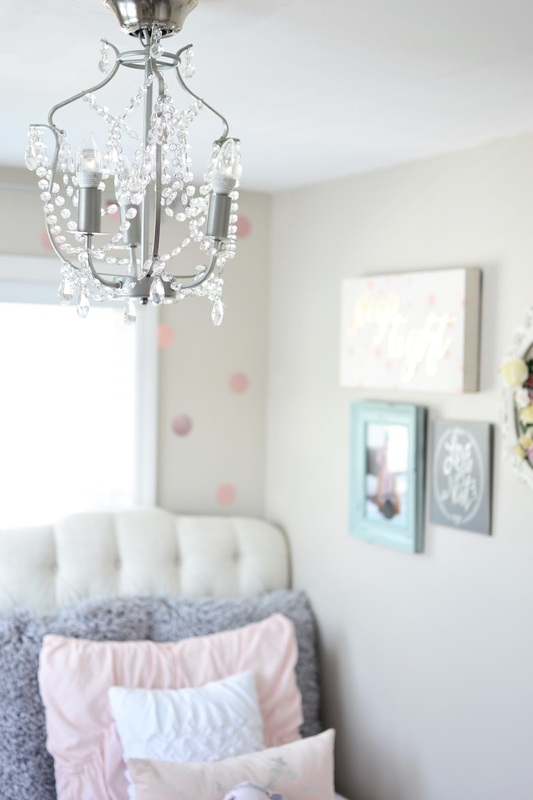 I hope you enjoyed Emme's big girl room reveal, I honestly had the best time shopping for her room and adding cute little touches to make the room very her. I can't believe my baby is 2 1/2 but she's so amazing and sassy and I love being her mom and watching her grow up. Also, stay tuned because Ben's room was upgraded too and we love it. If you are looking to update the rooms in your house, check out Raymour & Flanigan for a good variety of styles and price range to fit your needs.